Dubai: The Roads and Transport Authority (RTA) has announced two days of free parking across the city over the National Day weekend. The RTA also announced that parking across all paid parking zones will be free on December 2 and 3, except for multi-level parking terminals. Parking fees will be reactivated on December 4. 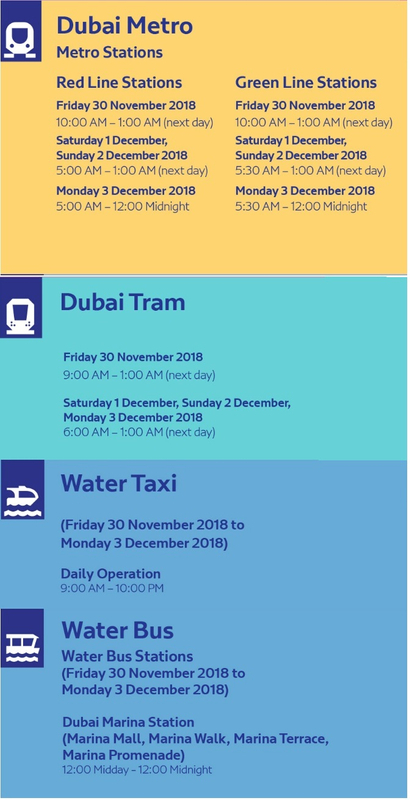 The Dubai Metro and Tram will run till 1am on Friday, Saturday and Sunday, offering an extended hour of service for the UAE National Day holidays, the Roads and Transport Authority (RTA) announced on Wednesday. The metro and tram services will begin at their usual time during the holiday period, but will end 1am after running an extra hour. In Abu Dhabi too, parking will be free on Sunday and Monday, the Integrated Transport Centre (ITC) of the Department of Transport (DoT) in Abu Dhabi announced. DoT’s Customer Service Centres will also be closed during the same period. 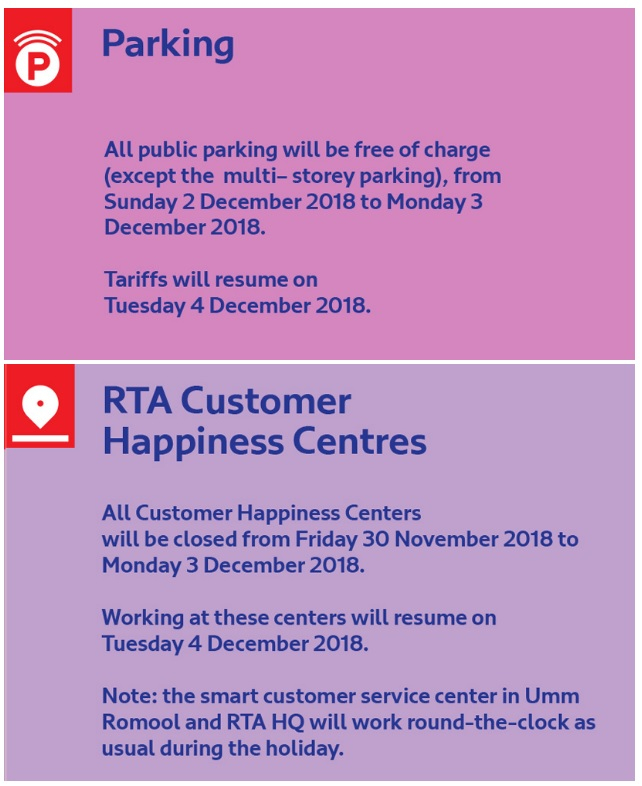 According to the RTA, all customer happiness centres will be closed during the 47th National Day holidays from Friday, November 30 to Monday, December 3. All of the RTA’s partner service providers as well vehicle registration centres will remain closed during the same period. However, the smart centres at Umm Al Ramool and RTA’s Head Office will remain open. In Dubai, buses at main stations such as Gold Souq Station, will operate from 4.25am to 12:29 midnight, and at Al Ghubaiba Station from 4.14am to 12.33 midnight. Services at subsidiary stations, such as Satwa, will operate from 5am to 11pm except for Route C01, which will be operating around-the-clock. Al Qusais Bus Station will operate from 5am to 11.45pm, Al Qouz Industrial Station will operate from 5am to 11.35pm and Jebel Ali Station will be offering services from 5am to 11.30pm. Inter-city bus from Al Ghubaiba will operate around-the-clock to Al Jubail, Sharjah, and from 4.30am to 12 midnight to Abu Dhabi. From Union Square, the inter-city services will operate from 4.30am to 12.30am past midnight, and from Al Sabkha Station, the services will be available from 6.15am to 12 midnight. Inter-city services from Deira City Centre Station will run from 6.07am to 10.06pm, while Karama Station will operate from 6.10am to 10.10pm and Al Ahli Club Station will operate from 5.55am to 10.15pm. The schedules of marine transit services during the holiday have also been changed. The Water Bus will shuttle at marina stations (Marina Mall, Marina Walk, Marina Terrace, Marina Promenade) from 12 noon to 12 midnight. The Water Taxi will be operating from 9am up to 10pm. The Dubai Ferry will be calling five times at Ghubaiba and Dubai Marina Stations at 11am, 1pm, 3pm, 5pm and 6pm. It will be running two services from Al Jaddaf Station to Dubai Water Canal Station at 12pm and 5.30pm, and two services from Dubai Water Canal Station to Al Jaddaf at 2.05pm and 7.35pm. Round trips will be running from Shaikh Zayed Road Station from 6pm to 12 midnight. During the holiday, the traditional Abra will operate at the Dubai Creek Stations (Baniyas, Dubai Old Souq, Al Seef), from 10am until 12 midnight. 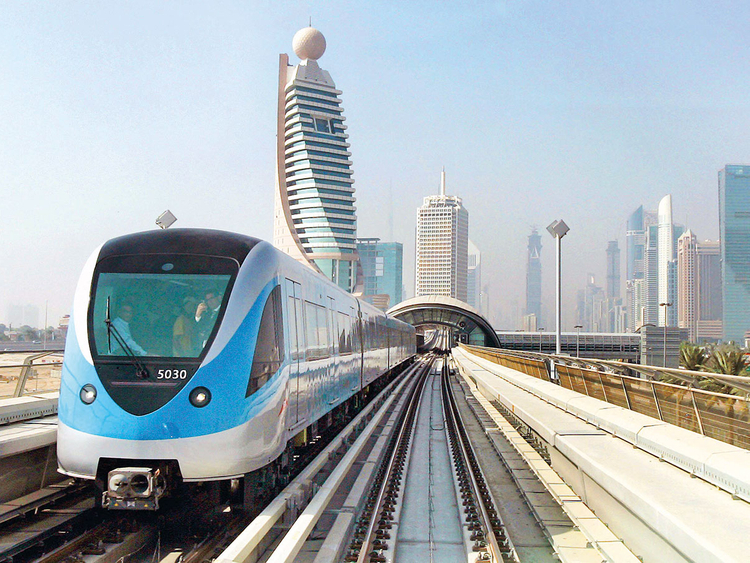 At the Shaikh Zayed Road Station, the Abra service will be running from 4pm to 10pm. The electric Abra will operate at Burj Khalifa from 6pm to 11pm, at Al Mamzar from 2pm to 12 midnight, at Al Qasr Hotel Station to Dubai Mall Station from 12pm to 11.30pm, and Burj Plaza Station (round trip) from 12pm to 11.30pm.